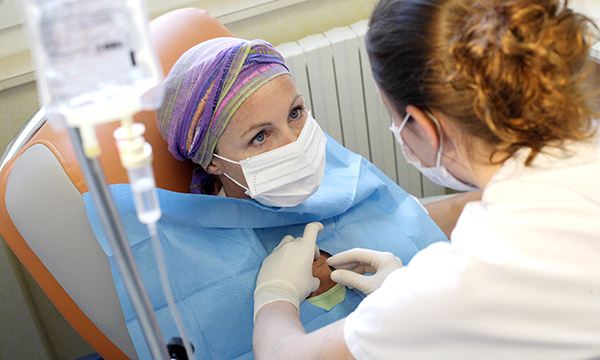 Women are less likely to get, and die from, cancer than men. More than half (54%) of women diagnosed with cancer during 2010 in England and Wales are predicted to survive for more than ten years, compared with 46% of men (Cancer Research (CRUK) UK 2014). But issues such as infertility, increased health risks associated with early menopause, and concerns around hair loss and appearance change can affect women deeply, according to CRUK’s head information nurse Martin Ledwick. ‘Cancer treatment can affect the fertility of men and women, but while men can bank sperm relatively easily, it is a far more complicated and less reliable process for women to freeze eggs and preserve their fertility,’ he says. Cancer treatment can often lead to an early menopause, for example when ovaries are damaged by radiation, chemotherapy or other medications or surgically removed. This, Mr Ledwick explains, can put women at risk of diseases associated with having an early menopause, such as osteoporosis. Mr Ledwick and his team of ten nurses at CRUK’s helpline take around 12,000 calls a year. He says another big issue’ particularly for many women, is hair loss. ‘While men can lose their hair during cancer treatment, it can be fashionable for males to have a shaven head. But some women have more complex emotions around hair loss. We know from the calls we take that many women are upset by it. ‘They may then feel guilt for being upset as they know the treatment has saved their life. They often don’t want to talk to their chemotherapy or ward nurse about how they feel because of the associated guilt. However, with two thirds of calls to the charity’s helpline coming from women, Mr Ledwick says this thirst for information can help nurses. Mr Ledwick adds that all cancer patients can be damaged by poor body image resulting from surgery, excess weight loss or gain, or changed appearance. While loath to make gender-based generalisations, he points out that poor body image following treatment tends to affect more women than men. Val Lang, nurse adviser at Target Ovarian Cancer, says body image is a ‘major’ concern among patients who contact the charity’s support line. ‘As well as the physical pain, loss of the reproductive organs through surgery can cause upset and the need for body image adjustment. ‘Younger women have to face the loss of fertility, when their plans for a family may not be complete. Target Ovarian Cancer offers information, support and signposting for anyone with ovarian cancer, including many of the 7,200 or so women diagnosed with the disease in the UK each year. Its research shows that 80% of women with ovarian cancer experience mental heath issues, such as depression, anxiety, stress, low mood and mood swings. ‘Open discussions about mental and emotional well-being, and signposting to support services, can make a big difference to women throughout treatment and beyond,’ Ms Lang says. Fellow nurse adviser at the charity Joan Idris points out that, after diagnosis, many women feel they have lost control of their lives and have been ‘taken over’ by treatment. There is a common perception that women with symptoms that suggest cancer go to their GPs earlier than men, enabling the disease to be diagnosed sooner and treated more successfully. However, while this is true for some types of cancer, research by Target Ovarian Cancer shows a lack of awareness of ovary cancer symptoms. During Ovarian Cancer Awareness Month in March, the charity hopes to raise the profile of ovarian cancer symptoms, such as persistent bloating, feeling full and a loss of appetite, pelvic or abdominal pain, and a more persistent need to pass urine. The charity’s research shows women with persistent bloating are more likely to consider changing their diet than visit their GP. Half of those surveyed by the charity said they would do something with their diet, whereas one in three (34%) said they would see a doctor if they were concerned about bloating. One in three women also mistakenly thinks that a smear test will detect ovarian cancer. Lack of awareness around symptoms is one of the reasons survival rates are low – just 46% of women with ovarian cancer will survive for five years. This is a much smaller proportion than for breast cancer, where five-year survival is around 87%, according to CRUK statistics for 2010-11. Other reasons, explains Ms Idris, include: misdiagnosis, often as irritable bowel syndrome or urinary infection; a lack of screening to catch the disease early; and a high rate of recurrence. Around 75% of ovarian cancer is recurrent and, once it has come back, it is diagnosed as incurable. New treatments for ovarian cancer are limited and aside from platinum chemotherapy and taxane drugs, newer treatments are limited and just three have become available on the NHS in the past ten years. This compares with around 20 new treatments for breast cancer. By her third bout of chemotherapy, nurse and breast cancer survivor Julie McDonald had lost all her hair, including eyebrows and eyelashes. ‘It was very distressing and knowing it would happen was a big blow to my self-esteem,’ says Ms McDonald, the deputy director of nursing at South Tyneside NHS Foundation Trust. The nurse, who is now in remission, was diagnosed with cancer of the right breast in May 2017, and underwent surgery, chemotherapy and radiotherapy. Ms McDonald’s nurse told her about the national charity, mynewhair, which has trained hundreds of stylists around the country to provide a wig cutting and advice service to those with medical hair loss. She met her local stylist, Darren Stuart, in Sunderland, before chemotherapy. ‘I wanted to choose a wig before the chemotherapy started. The fact that Darren was willing to see me before my treatment and before I had received my wig voucher was a huge help. ‘He showed me lots of different wigs and ordered one in exactly the right colour and styled to look like my own hair. ‘It was so reassuring going in for my first chemotherapy appointment to know that I already had my wig. ‘Losing all my hair was distressing, but my wig was a lifesaver. If it had fitted badly or didn’t look like me, I would have struggled. But it gave me the confidence to carry on with life as normal.